Hi all, after some research of similar issues I come to you. 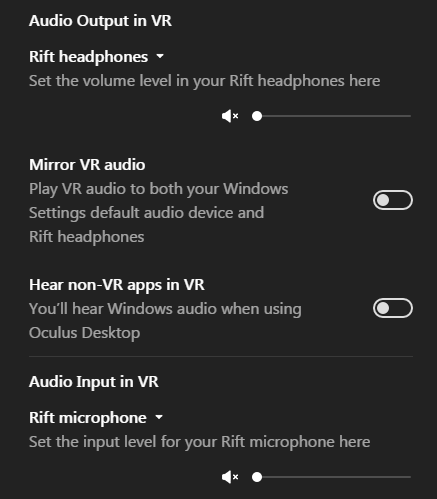 It has been few weeks I can't use my oculus headphones or microphone, I can select the rift in "Audio Output in VR" or "Audio Input in VR" but the volume is at the minimum with a little "x" and it's impossible to increase it. - changed the privileges with regedit in "Computer -> HKEY_LOCAL_MACHINE -> SYSTEM -> CurrentControlSet -> -> services -> AudioSrv" from "SeChangeNotifyPrivilege SeImpersonatePrivilege SeIncreaseWorkingSetPrivilege" to "SeChangeNotifyPrivilege"
I don't have the rift in the audio devices list, same for recording devices.